While it s not your typical state for retirement, many active adult communities near Wilmington, DE are becoming popular. Developers know that empty nesters and retirees want to be close to their hometowns, families, and jobs. Wilmington, Delaware and New Castle County are home to many 55+ active lifestyle and low-maintenance communities. Active adult communities in Wilmington, DE enjoy living in a state rich with history, attractions, and a four-season climate. Residents of 55+ communities in Wilmington, Delaware, enjoy a four-season climate. While winters are cool to cold, summers are hot and humid. The average low temperature in January is 24 degrees Fahrenheit while the average high in July is 86 degrees. The average precipitation for the year is about 43 inches and average snowfall is 20 inches per year. Active lifestyle communities in Wilmington are located within the largest city of the state. It has a total area of 17 square miles; of which 10.9 square miles is land and 6.2 is water. Situated about 25 miles southwest of Philadelphia, it sits at the connection of the Christina and Delaware Rivers. Greenville, Elsmere, Newport, Talleyville, New Castle, and Bellefonte surround Wilmington in Delaware as well as Penns Grove and Pennsville in New Jersey. Active adult homebuyers are drawn to all of the great arts and entertainment opportunities in Wimington. The city s entertainment and annual events include Art on the Town, Wilmington Children s Choir, In the Square Summer Lunchtime Concerts, DuPont Clifford Brown Jazz Festival, Riverfront Blues Festival, Fringe Wilmington Festival, and Caroling on the Square. There are over a dozen museums in Wilmington. The Delaware Museum of Natural History, Delaware History Museum, Delaware Children s Museum and Delaware Art Museum are just a few of many. Recreation is also abundant for active adults living in a Wilmington, DE 55+ community. 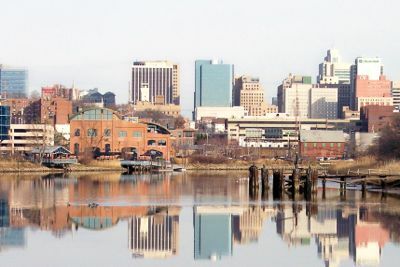 Wilmington is home to Brandywine Park, Brandywine Zoo, Baynard Stadium, Alapocas Woods Natural Area, H. Fletcher Brown Park, and Rockford Park. While the cost of utilities, healthcare, and groceries are higher than the national average, the overall cost of living index in Wilmington is lower than the state and national average. The cost of living within an adult community located in Wilmington is six percent less than the Delaware average and two percent less than the national average. While the income tax rate is higher than normal, Delaware does not tax on sales. There are 12 hospitals throughout the state of Delaware, two of which are highly ranked. Christiana Care in Newark and Bayhealth in Dover have been recognized for specialties in different categories. Within Wilmington, active adults have access to St. Francis Hospital, the Wilmington VA Medical Center, and Christiana Care Wilmington Hospital.